Rebellion’s Sniper Elite V2 gets a bunch of DLCs and they will come in both free and paid flavours. If you remember last month’s paid single player DLC, that is now free to players this month, and its the Neudrof Outpost map. There’s more, however, with a new multiplayer map for the game and a new mode being offered for free in October, and they come in both individual and team varieties. What you have to do is collected dogtags from fallen enemies–seems simple doesn’t it? Modern Warfare 3 also had the same mode where you pick dogtags to confirm kills. 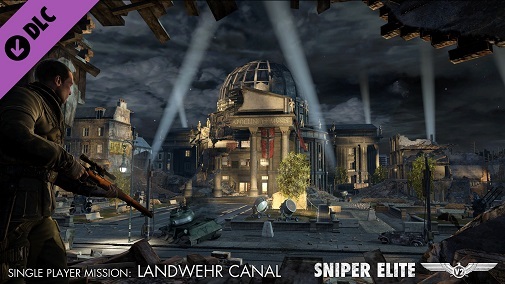 The Landwehr Canal Pack contains a single-player mission and three new weapons. “The mission tasks players with taking out three German generals as they convene in night-time Berlin,” according to the official description. The pack will be available on Steam on 18th October and pack is paid, costing $5. There are also two new sniper rifles available like The Lee Enfield Mk. III and the Japanese Type 99. You can also use an MP44 SMG to mow down everyone close to you. Bam!